For those on a budget, FishHawk is the place to be these coming months, announcing its annual FishHawk Ranch Community Garage Sale and first-time FishHawk Ranch Farmers’ Market. In its ninth year, the FishHawk Ranch Community Garage Sale will be held on Saturday, April 10, from 8 a.m.-12 Noon. Here residents will be able to sift through housewares, baby items, furniture, clothing, exercise equipment, bicycles and scooters, appliances, grills, books, toys, artwork, home décor and much, much more. “You name it and you can probably find it for sale at the FishHawk Ranch Garage Sale,” asserts FishHawk Ranch by Newland Communities Event Coordinator Jennifer Palermo. Also taking place, a “Twilight” pre-sale will fall on Friday, April 9, from 3 p.m. until dusk, giving FishHawk residents only a chance to get a head start on the sales. Last year’s garage sale turned out a crowd in the hundreds, with approximately 500 homes participating in the annual event. Those residents who would like to partake in 2010’s sale are welcome to for a fee of $5. Registration will be held via www.FishHawkConnect.com or at the Osprey Club until Friday, April 9. If residents have items left over from their garage sale, they are welcome to head over to Park Square, the Osprey Club or Hawk Park where donation trucks will alleviate them of their goods, benefiting Goodwill Suncoast Industries and St. Vincent DePaul; these areas will also be available for parking.New this spring is the FishHawk Ranch Farmers’ Market, uniting almost 20 vendors from Lakewood Ranch, Lithia, Plant City, Brandon and Riverview into a one-stop fresh market on Saturday, May 1, from 9 a.m.-2 p.m. at Park Square, located at 16144 Churchview Dr. in Lithia. Foodies will be able to choose from a variety of goodies such as fresh vegetables, fruits, cheeses, baked goods, breads, healthy snacks, fresh-squeezed juices, jams, jellies, nuts, teas, coffees, herbs, honey, flowers, plants and more. According to Palermo, “The Activities Department has been trying to get one started for a few years now. However, the challenge was always recruiting enough vendors.” She adds, “We are very excited! The residents are ready for this!”That they are as proven by www.FishHawkConnect.com’s message board. 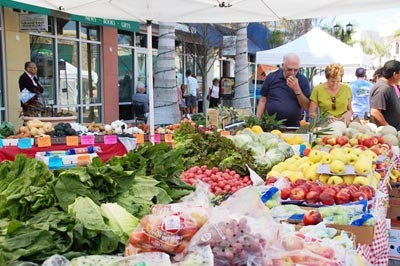 FishHawk resident Cheryl Rodriguez says, “We would love, love, love a farmer’s market!” If the event is a success, it will be continued throughout the year on the first Sunday of each month. Licensed vendors can participate for a cost of $20. For more information, call 654-6360 or e-mail jpalermo@fhrhoa.com.